I really, really wanted to go snowshoeing this year, and we had a trip all planned, but then we got sick, and it didn’t happen. Oh well, I just figured we’d put that on the list for next year, and that was ok. But then we went up to Mt Hood a few weeks ago (April, mind you) and stopped in at the Zigzag Ranger Station to ask about a hike. I was hoping for a hike where we could see the mountain reflected in a lake. The ranger said everything was still snow covered but suggested we snowshoe into Trillium Lake! Can I just tell you I was beside myself excited? We asked where to rent, and he told us we could either go back the way we came a few miles to the ski shop in Welches or go up to Government Camp. We didn’t want to go backward to go forward, so we opted for Government Camp. 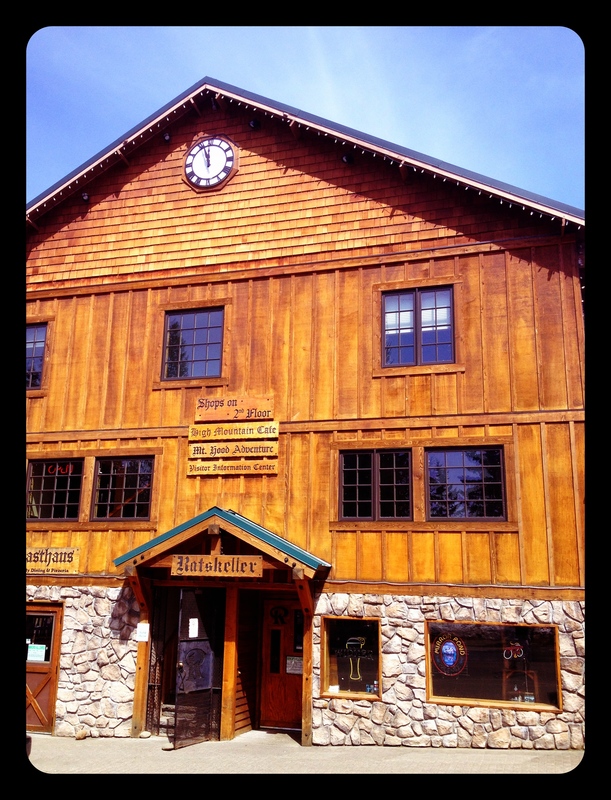 It was midweek, and we had to try four places to find somewhere open, but we got two sets of shoes and poles for 24 hour rental for just $20.00 from the super-friendly Mt. Hood Adventure, and we were on our way. Well, actually, we were almost on our way when we realized we’d forgotten to get the very important sno*park permit! So after another quick trip upstairs we really were on our way. 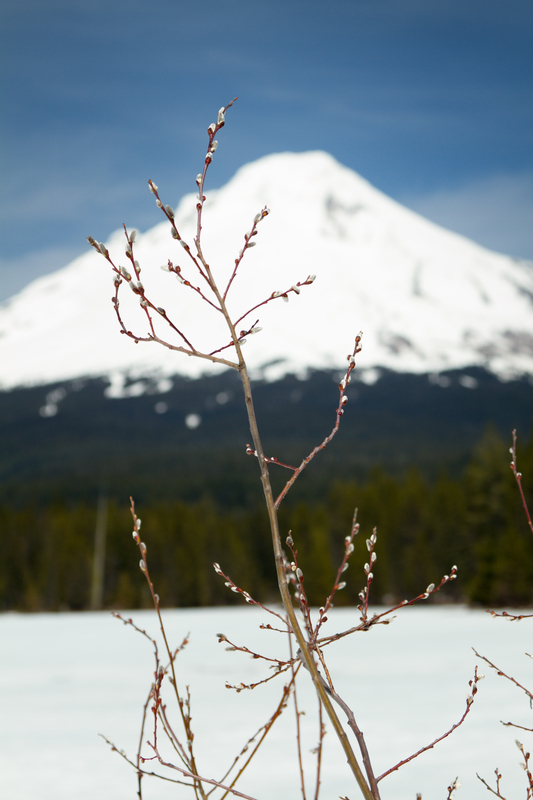 If you’re familiar with the area, the trailhead for Trillium Lake is directly across the street from Snow Bunny, and there is a gorgeous view of the mountain right from there. There was only one other car in the parking lot! I don’t think I’ve ever been anywhere on that mountain where there was only one car in the parking lot before! We arrived around noon, and it was already warm out. The day was predicted to be one of the nicest of the year so far, with temperatures up to almost 70. 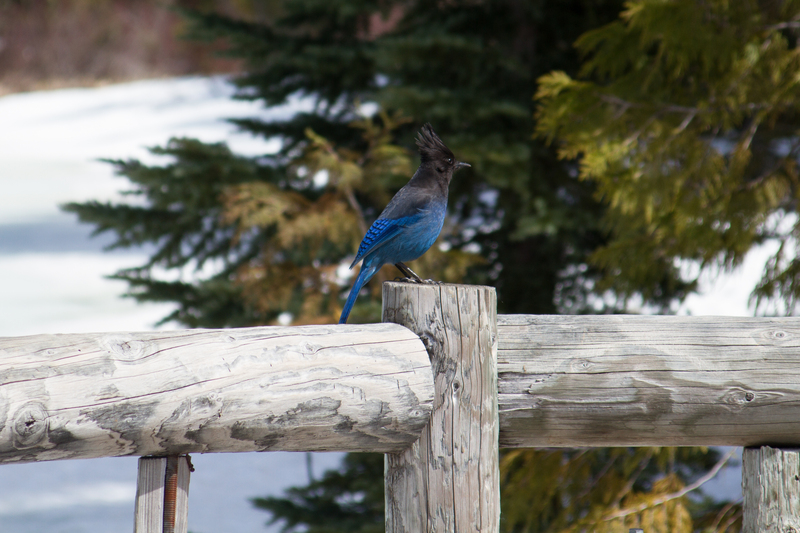 The skies were blue, the sun was shining, and the wind was whistling through the evergreens. It was gorgeous and I felt so lucky and so happy as we headed down the trail. 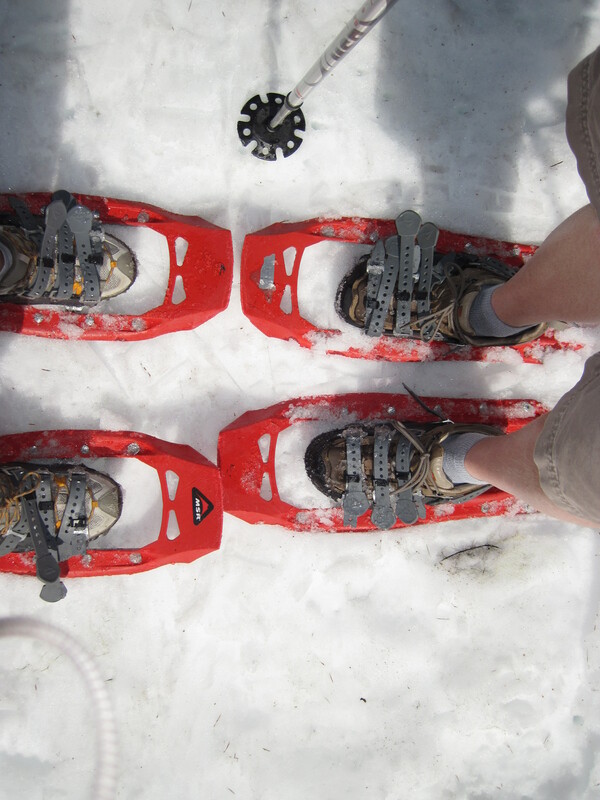 Snowshoeing is definitely not difficult, but it does require a bit of a different gait than walking, and it apparently uses those muscles in one’s shins a little more than other activities, because mine were tired by the end of the day! There’s not a lot of falling down like (when I am) skiing, but we like using poles when we go just to help keep our balance when the snow’s a little uneven. Jeff heading down the trail! Notice he’s wearing SHORTS! 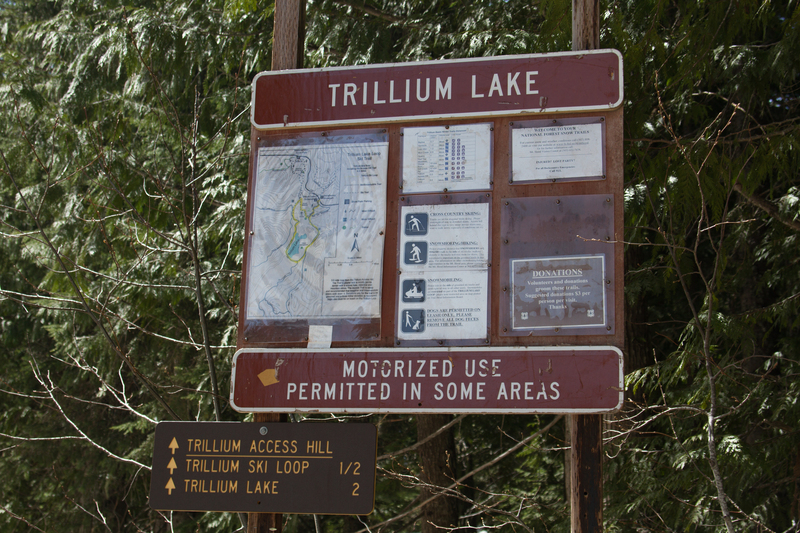 The Trillium Lake trail is a four mile hike if you go down to the lake and back, or a five mile hike if you do the loop around the lake. We opted for the down and back. We actually don’t mind out and back hikes, because it usually feels like a completely different hike each direction anyway. The trail goes down for about a half mile, not too steeply, but definitely going down, then levels out for a bit, then has some rolling hills, and finally you’re at the campground loop (open in summer) and just a little further on you arrive at the lake (pit toilets open now, thank goodness!). There is a gorgeous view of the mountain from the lake, and I definitely would have had my mountain reflection view had it not been for the fact that the whole lake was still frozen over. Oh. Didn’t really process that all the way through. Didn’t actually really care once I got there, either. It was beautiful and so peaceful and relaxing. There’s a little dock at the lake’s edge with a bench on it where we hung out in the sun and had a picnic lunch. Some little friends were very interested in our lunch, too! 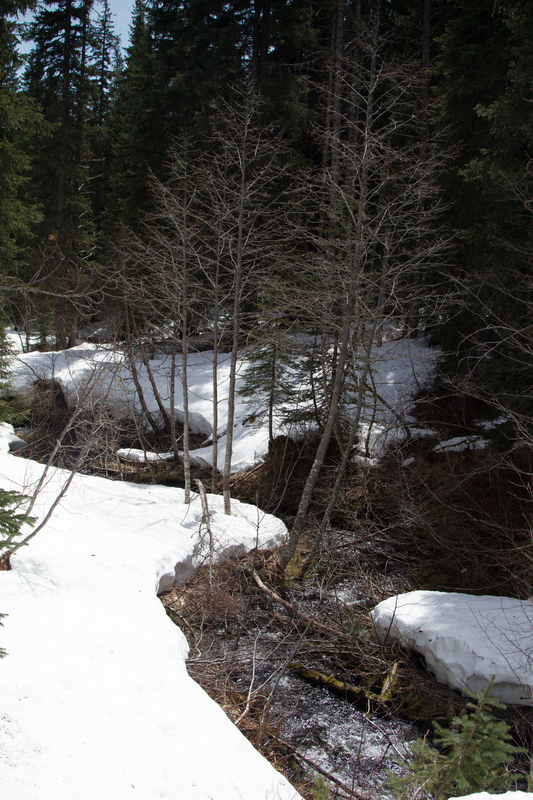 This spring snowshoe was a delightful surprise, and I would highly recommend a snowshoe in spring if you have a chance. It was great just to be able to go out in t-shirts and shorts, not all bundled up like in winter. 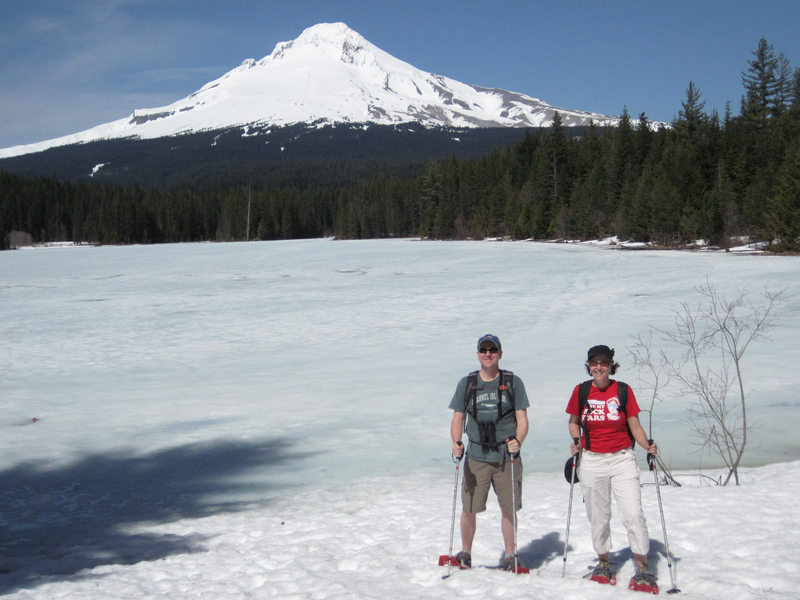 But I will take a snowshoe anytime, and Trillium Lake is a great trail for beginners. We’re determined to snowshoe more next year. You should hold us to our promise! Leave us a note in the comments if you have a place you think we should try! Oh, you were in my old back yard! Trillium Lake is a beautiful spot. I haven’t been there for years. 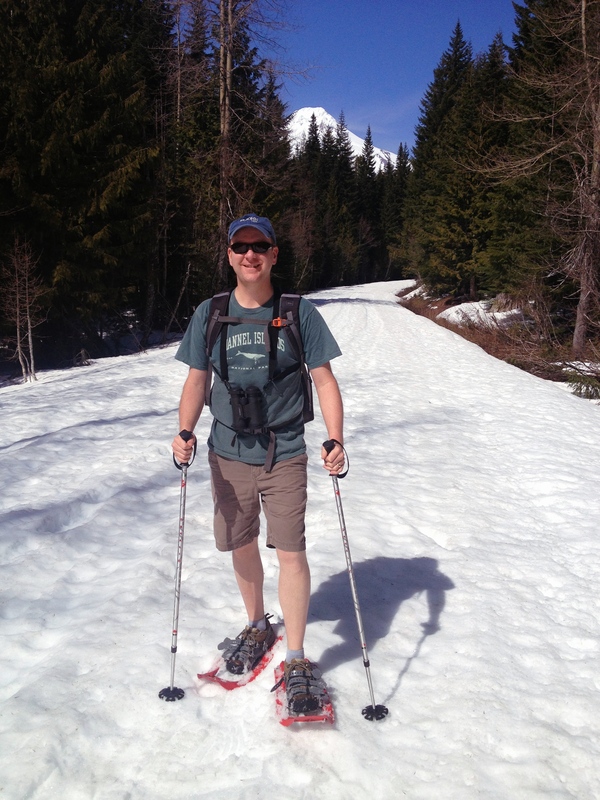 I haven’t been skiing in years, either, but I will say that spring skiing in shorts used to be one of my favorite things to do. (Just had to make sure I didn’t fall down, because that would have hurt!) Go glad you got an unexpected treat; those are so often the best kind. heading there for holiday break..can’t wait to snow shoe this trail while the rest of my family is skiing. thanks for the tips.